This article first appeared in Options, The Edge Malaysia Weekly, on May 22, 2017 - May 28, 2017. It is late in the evening at the Kuda Merah Muay Thai gym in Pusat Latihan Polis — or Pulapol — in Jalan Sultan Yahya Petra. It is drizzling in the Malay heartland of Kuala Lumpur and the area is busy, bustling with cars and motorcycles rushing to various destinations. At the gym, located deep in the police training centre, a row of worn out punching bags serve their purpose. They are not the flashy Everlast or Fairtex types but rolled up and tape-wrapped mattresses, and they regularly take a beating from aspiring Muay Thai fighters who throng the gym. There are also some basic rusty weights in a corner, a makeshift wooden bench used for both shoulder and chest presses, as well as boxing gloves, hand wraps and other equipment, all drying in the corner of an old boxing ring. While this unfashionable gym has surely seen better days, it still sees plenty of action. In the ring, young men in their twenties are battling it out, throwing super hard kicks and exchanging punches, even using their elbows and knees, all with mean intentions. An old man watching in the shadows steps up to the ring and stresses a point to one of the fighters. The younger man, clearly in awe of his elder, shows immense respect, absorbing every word the senior man says and bows at the end of the instruction — a sign of great esteem in the fighting world. The old man, clearly in his sixties, moves swiftly around the ring. While weaving and bobbing his head, he feints with a left jab and throws a right cross, followed by a left uppercut, a right hook and ends the move with a hard low kick, aimed at the meaty outside part of the thigh. His movements flow almost seamlessly, with no pause in between the punches and the kick, indicating a man with many years of experience in the art of eight limbs — Muay Thai. 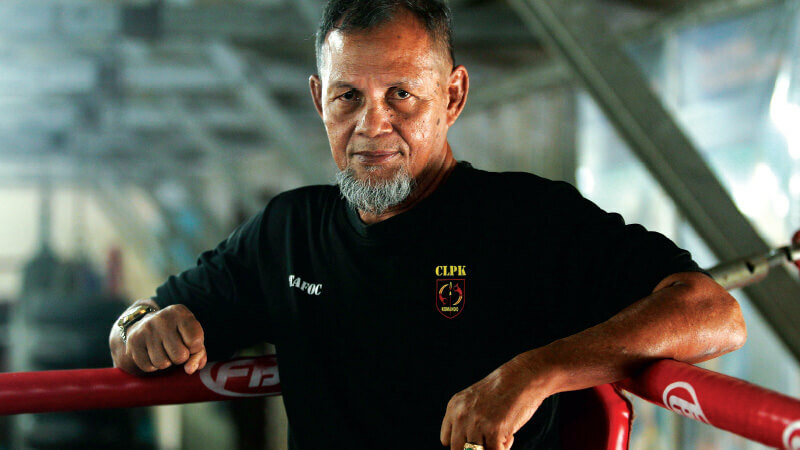 The 66-year-old man is Hussein Deris, better known as Poksing Apollo — the most celebrated Malaysian Muay Thai fighter ever. In his day, back in the 1970s and early 1980s, he gave the top-ranked Muay Thai fighters in the world a run for their money, more often than not coming out on top. “I’ve fought more than 350 times … And I fought in Lumpini Stadium (also known as the Mecca of Muay Thai) a total of 21 times,” he says. It is then that we realise how difficult this interview is going to be, with Poksing only speaking Baso Kelate — Malay with a thick Kelantanese accent — and Thai, and spelling is not one of his strongest traits. On one wrist, he has on an old watch, a faded gold Rado Diastar from the early 1970s — possibly a sign of better times in the past — and on the other hand, he wears a silver ring with a large green stone on it, maybe an emerald, but we cannot be certain. It is clear though that Poksing has seen better days. Age has caught up with him. His hairline is receding and the tuft of hair on his chin is almost completely grey now. His frame is that of a fighter, with broad shoulders. There are battle scars on his face, evident from the scar tissue on his eyebrows — they indicate the sort of life he has led. While not obvious, we are sure some of his teeth are missing as well. He is friendly, soft-spoken and, unlike many chest-thumping fighters of today, does not focus on his victories. He is quite the opposite, downplaying his achievements and full of praise for his opponents. He laughs a lot, at himself mostly — at how he was knocked out in some fights and how he lost in others — but it is clear that he does so because he has nothing left to prove, having been among the most celebrated Muay Thai fighters of his era. At his peak, Poksing was a revered fighter, a skilled and technical Muay Thai practitioner. Many feared his tenacity and never-say-die attitude. According to the older fighters, Poksing had a very good chin, meaning he could take hard punches to the head without getting knocked out. But Poksing is, as always, modest. He only talks about a fight he will always remember. “It was against Ponchai Sithalesak … I got knocked out (he laughs), I got kicked in the [side of the] neck and was out cold from the time of the fight at night, about 10pm, to 7am the next day … then we fought again … I won,” he smiles. While he is jovial, ever ready to share a joke, there is a reserved side to him as well, and there is a certain sadness about him. The sadness, it is evident, stems from some possible emptiness in him. He goes by the name Poksing as it is a Kelantanese truncation of “Pak Hussein”. And because of his signature move, the flying knee — involving a jump and the thrusting of his knee to the head or upper body of an opponent, resulting in a stunning knockout at best — he was given the nickname Poksing Apollo. “They say the speed of my jump and the thrust of my knee were like the Apollo spacecraft taking off, heading for the moon,” he laughs. The oldest of five siblings, Poksing was born in Narathiwat in the south of Thailand but grew up in Kampung Kedai Buluh, Kota Baru, Kelantan, where his family lived. While selling fish one day, he was horsing around with the other boys, and his strength and talent showed. This was noticed by the village headman, the tok penghulu, who took him out of the market and pushed and trained him to be a fighter. “There were no tournaments in Kelantan back then, so I had to fight in Thailand … I made RM5 a night fighting in Tanyong Mat (Tanjung Mas) in Thailand, and slowly my purse got bigger,” Poksing says with a smile. He adds that at his peak, he made up to RM600 per fight. “It was a huge amount back then, RM600 … but now I hear they pay RM6,000 a night,” he chuckles. He speaks fondly of a fellow fighter, Pongchai from Thailand, and talks about how he and legend Wirat Lok Thong fought a total of 13 times. When asked about the outcome of the fights, in true Poksing fashion, he says, “I lost once.” Then, after a pause, he says, “We drew three times.” When Options asks if he won nine times, he merely nods. Another highlight of his Tomoi (Muay Thai in Malay) career is travelling to Japan and fighting there, although he does not know exactly how to explain what he saw and felt. “It was in the 1980s. I can’t remember the name of the person I fought — it was a strange name … a Japanese name … It was very cold in Japan,” he says when we pressed him for more details. Only when prodded does he share that he won against the Japanese fighter as well. Other names he mentions or speaks of include Tana Thlong Prongpayat, Truanchai Widhudta and Yad Sok Thong, a famous fighter in Bangkok known for his heavy kicks. He would let loose with seven or eight continuous kicks. “We fought twice [Yad Sok Thong and I] … we each won once,” Poksing says, now seeming to understand our need to know if he won or lost. While the use of belts to indicate a champion was not in practice, Poksing says he was ranked highly as a fighter based on his purse money. In Malaysia, Muay Thai was banned in Kelantan (the ban was only lifted in 2001). “But we bent the rules sometimes … In 2000, I fought an ex-army boxer Hussein Ular in Kelantan … It was under a silat fight card, though. But of the many fights, only one was silat; the rest were Tomoi fights,” he says with a chuckle. Poksing’s last fight was about five years ago. “I knocked out a 20-something-year-old fellow,” he says with a smile. What he doesn’t say, however, is that the only reason fighters past their prime, himself included, step into the ring today is to make money, to earn a living. If the fight gets too difficult for the old warrior, a light blow to the head will more often than not translate into a knockout. The next question was a painful one but one that had to be asked. How much longer does he think he can carry on? He frowns and, after what seemed like an eternity, he says, “It depends … fights are irregular, sometimes once a month, sometimes four times a month — it depends on the organisers. “My life is Muay Thai. If there is a fight, even if I’m not involved in training the fighters or whatever, I go to watch. My entire life has been about fighting and now as I am older, it’s more about teaching people how to fight,” he says, without answering the question. We hope that the next time our paths cross, Poksing — now in the twilight of his life — will have a much happier tale to tell, as unlikely as it may seem. Sergeant Rosli Yaacob, president of the Kuda Merah Muay Thai Club, sat through Options’ interview with Poksing Apollo, helping to translate what the old gladiator said. Malaysia has more than 200 Muay Thai gyms, but Kuda Merah — with a fan base of 30,000 — is by far the largest. Rosli himself has been involved in the fight game for more than 40 years and has been involved in both Muay Thai and boxing on an international level. Known to be one of the fiercest proponents and keen supporters of Muay Thai in the country, Rosli helps explain why other sports and their practitioners seem to be thriving while a Muay Thai legend like Poksing struggles to make ends meet. 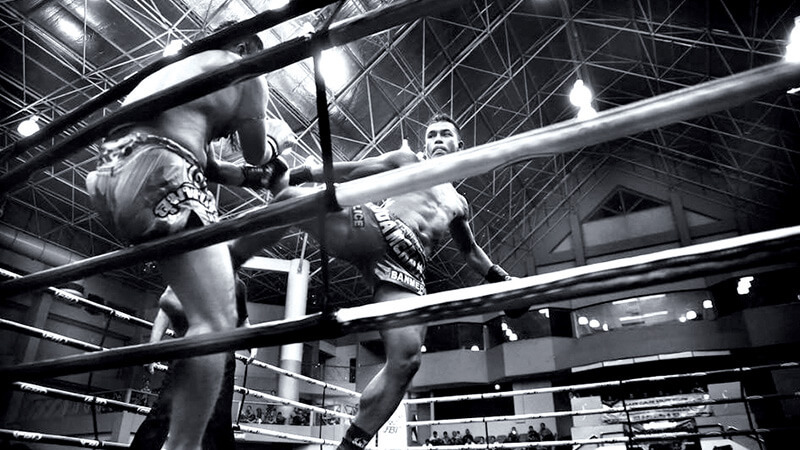 The history of Muay Thai — or Tomoi, as it is known here — is chequered. In Kelantan, it was outlawed until 2000, and while it is popular in Kedah and Terengganu, it is new in the other states. “In Kelantan and Terengganu, the name Hussein Apollo remains a top name in Tomoi circles,” says Rosli. But Muay Thai was only recently accredited by Majlis Sukan Negara Malaysia and it was not even considered a sport previously. Also, it was only in 2013 that it was included in the Southeast Asian Games. Thus, Muay Thai practitioners are only in the spotlight now, getting recognised and enjoying some fanfare. The martial art has even been approved as an Olympic sport, but it is uncertain when it will make its debut. Moreover, in line with the popularity of mixed martial arts (MMA), Muay Thai has also grown in popularity. The main components of MMA are Muay Thai, Brazilian jiujitsu, boxing and wrestling. “To cut a long story short, Poksing’s generation suffered for the next, for them to enjoy the benefits. You will not see the greats of Muay Thai of yesteryear gaining much prominence … but one day, we will sit down and write the history of Muay Thai or Tomoi in Malaysia for the benefit of the younger generation. 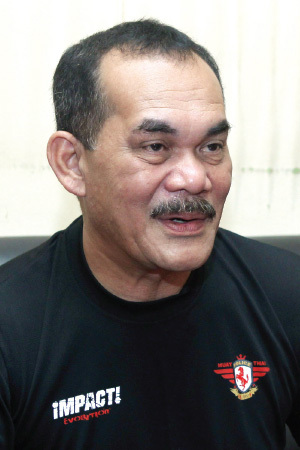 “Now we have Faizal Ramli, the Contender Asia fighter; Tengku Shahrizal, better known as Pokku, one of the best fighters ever; Lokman Akimi, our SEA Games gold medallist … so many good fighters. Sadly, in the earlier days, there was nothing. The older fighters can only watch while the younger ones get the acknowledgement … but that is how it is,” Rosli concludes.